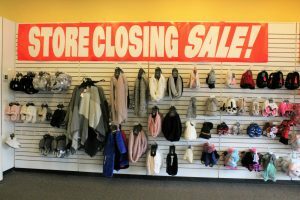 Payless ShoeSource, located at 1205 N. Main in Logan, will liquidate all of its inventory as the national retailer begins closing some stores in March, though most will say open until May. Another national retailer is closing up shop. Payless ShoeSource has announced it will be closing its 2,100 remaining stores in the United States and Puerto Rico. Earlier this year Shopko announced it was going out of business, Gymboree announced last week it would be closing approximately 800 stores nationwide. Payless ShoeSource in Logan is having a closing sale. The store is the latest retail chain to close up shop in the United States. There are approximately two dozen Payless ShoeSource locations throughout Utah, including stores in Logan, Tremonton and Brigham City. Liquidation sales for all stores began this past weekend and will continue over the next few months. Some stores will close by the end of March, others will remain open through May. It is not yet known how long the Northern Utah stores will remain open. According to a report from the Associated Press, the shoe company is also winding down its e-commerce operations. The company previously filed for Chapter 11 bankruptcy protection in 2017, resulting in hundreds of stores being closed. Alison Krebs of Logan is taking advantage of Payless ShoeSource going out of business sale. Payless is the latest retail chain to close up shop in the United States. The discount shoe store will close all 2,100 of its locations in the United States and Puerto Rico in the coming months. According to the Associated Press, the company said in an email that the liquidation doesn’t affect its franchise operations or its Latin American stores, which remain open for business as usual. It lists 18,000 employees worldwide. Payless was founded in 1956 by two cousins, Louis and Shaol Lee Pozez, to offer self-service stores selling affordable footwear. In addition to Shopko’s announcement earlier this year, Gymboree and Ascena Retail, the parent of Lane Bryant and other brands, join a list of national retail names like Toys R Us and Bon-Ton that have closed down in the last year. Logan has seen a number of big box retailers close up shop over the last few years, including Kmart, Herberger’s, and Bed Bath & Beyond.